Having been left behind to deal with the aftermath of their bombshell revelation and a family torn apart, Eden has no time for Tyler when he reappears. But where has Tyler been? And is she as over him as she likes to think? Or can Tyler and Eden finally work things out, despite their family and against all the odds? If you've read my post from earlier this year called 10 Reasons You Need to Read DIMILY, you'll know this is an amazing trilogy. In fact, it's one of my favourites - and now it's come to an end. In the final book of the trilogy, Eden is done with Tyler. It's been a year since he left and completely cut her off. Now, she's trying to start a new chapter in life... a life that Tyler isn't in. 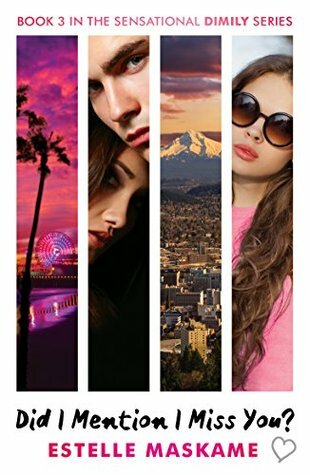 But when Eden returns to Santa Monica, having completed her first year of college in Chicago, she is forced to face Tyler, the future, and how much they've both changed. Let's jump straight in: I love character development, and it's clear that everyone has grown up so much since the first book. This is actually something that Maskame is particularly good at, not to mention the cuteness; if you're looking for an intense YA romance with a twist, you need to read DIMILY. I'm actually envious of those of you who have yet to read these books; I wish I could experience them for the first time all over again. I'll miss Tyler and Eden a lot. In fact, I'll miss everyone. Luckily, Maskame is writing a new standalone, so we'll have some new characters to fall in love with soon! I cannot recommend these books enough and if you haven't discovered them yet... well, what are you waiting for? If you've read the first two books but have yet to get your hands on this one, never fear, because I have an extra copy to give away to one of you! This is open to residents of the UK only, and closes on August 3rd. Good luck!